The nod of deference. The soft, submissive acceptance. A profusion of polite thank yous. As we settle down to start the interview and I congratulate Mr. Ghulam Muhammad on winning the prestigious Jameel Prize it is this quiet humility and grace that defines my first meeting with the artist. Originally hailing from a small village beyond Sibbi where water is scarce, infrastructure is non existent and temperatures soar upto the fifty-something and then having lived in Balochistan, “GM” as he is popularly known, made the move to Lahore which changed his life: a journey, which he recounts, was not easy but certainly, as he puts it, fate was kind. His solemn and quiet demeanour set the tone as we begin delving into the intricate nature of his collage work which involves the painstaking act of cutting and what he calls”carving” letters out of the written text in old books he buys from Anarkali. These minute letters are then arranged and glued to waslis so they overlap to create densely packed and unique compositions, often in high relief. Proficient in painting, drawing and sculpture, GM lays great emphasis on choosing a medium that expresses an idea most convincingly. He relaxes as he begins talks about the act of making art. Undeterred by the labour and pain of sitting all day, GM seems to revel in the act of the making, his work is process-based and that is of great importance to him. He calls the process meditative as he becomes immersed in his work. Qualities such as patience, perseverance and tolerance are essential and he is very earnest when he points this out. As he states this in firm but perfectly measured pauses and cadences I cannot help but quip that his process is not unlike that of a miniature painter, a fact that he is quick to agree with as for him whether it is a qalam or his letters it is the repetition of the act that allows something to emerge and this he says, automatically warrants immense satisfaction or rather a sense of achievement on his part. Since we are on the topic of meditation I also enquire into the almost consistent reappearance of the circle as a motif in some of his works. In one instance the letters within a stopwatch are dissolving, as if in a whirlpool descending towards a center. 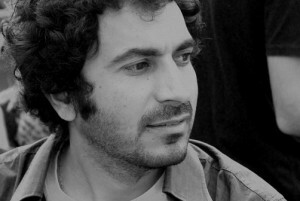 The fascination with the relationship between language and identity and his curiosity about the evolution of its nature in today’s global context drives him, it becomes the central focus of our conversation even as he admits to a romance with acquiring mastery over languages, affectionately associating the process of learning and speaking them with a certain “chaashni”. He cites Ibn-e-Insha, Putruus Bukhari and Manto as his favorite writers and declares the multilingual city of Quetta as his muse, having gifted him proficiency in five languages. It began, he says, with his thesis work at BNU with him weaving a monumental carpet made of paper taken from old discarded books.The warp and weft weave, he said, the layering, the mixing of letters which rendered them illegible became metaphors for the complex history of language, for its process of disjuncture and discovery, both of which lay within these overlapping strands. The fragility embodied in the old paper thus became a very important vehicle for expressing this idea. Manto and the use of his text in one of his works is brought to the forefront. 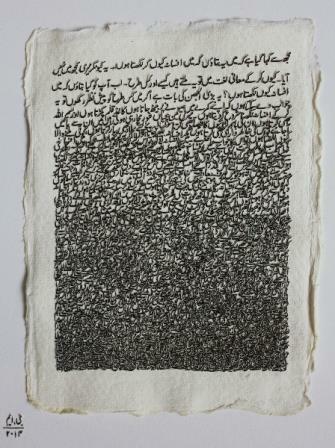 GM becomes expressive and in great detail describes how, in his Solo Show he presented his carved text in a single continuous line meant to be read not from right to left as is the norm when reading text in Urdu but from left to right. “Text is not just text, it is a visual in my work. Our recognition of text is associated with the meaning of words, if it’s function ceases then other things happen. I reimagine words, give them a new life and context so they emerge as a new visual form “he states matter-of-factly. As he elaborates on this statement, GM talks about his observations and concerns relating to language. His own sense of alienation whenever he moved is quite evident, his calm persona is belied in the frustration of his tone as he recalls how his mother tongue spoken in his village/region is on the wane and dying, urdu to him at that time seemed more dominant being the national language till he came to the city and realized that english in turn is more dominant than urdu. The relative relationship and its status varied according to location and this unnerved him. This alienation took on a sense of irony as he talked about the concept behind the barbed wire piece constructed from letters which he made during his Sanat Residency in Karachi. Changing tracks I ask Ghulam Muhammad to talk about his interest in letters as visuals, he expresses his fondness for the shape and structure of letters when he recalls his love for writing takhtis as a child. 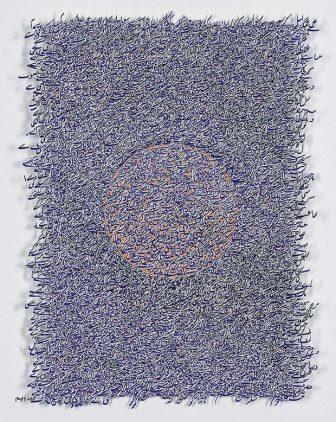 While studying Ghulam Muhammad’s work at length, I was struck by how, on some abstract level the pieces alluded to nature; the mass of letters floated, dispersed and overwhelmed the senses, sometimes they were akin to fragmented islands on a map,they resembled dense fields whose synchronized ebb and flow could be likened to the wind whooshing through a field of dry grass making it rustle this way and that, they could radiate energy lighting up our senses where we imagine a rhythmic hum of voices or to flip it on its head the compositions could transform into a morass that resemble the clamour, confusion and dissonance of conflicting ideas. I realize that I have perhaps been too expressive describing his work when I share these comments with him and we end up talking about the nature of illusion for an artist but GM is contemplative and he measures his words as he speaks. 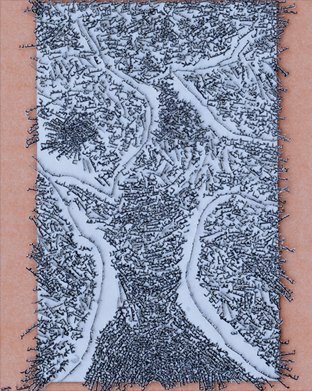 “Titles restrict the meaning and understanding of my work. A work of art must resonate with every person in a different way…a group of females saw my work in Turkey and thought my piece was made of fabric and not paper, I did not correct them because what they think is their prerogative…somewhere or somehow our surroundings and environment influence our work. Our five senses drive our observation. I will give you the example of my village. I come from a dry, arid land. Pale yellow in fact, like the colours of the pages in my old books. I am fascinated by that paper because of the colour” he admits. I point out that his narration of the scarcity and hardship that is involved in the collection of this water, its preciousness as well as the tough life that he has lived is transmuted in his process: the acquisition and collection of letters in tiny jars, valuing the preciousness of used books, working without a fan. 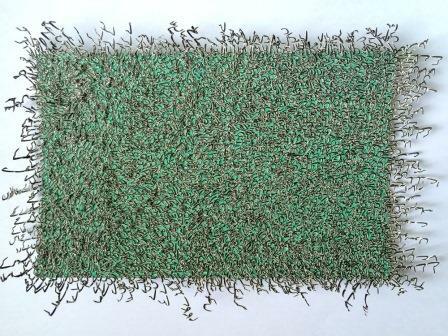 While it is interesting that Jenny Holtzer, Bruce Nauman and Shirin Neshat have impressed him, it is more intriguing that even at his 1-month Sharjah Residency, he chose to use recycled material such as newspapers to project their “carved” text onto a dry, sandy hill, a landscape not unlike that which he describes when talking about his village. “Maybe, there are links, but I also do have sciatica as a result now” he admits sheepishly and laughs. We end our interview on a light note but this time I silently imagine tipping my head in deference to an individual, who against all odds has achieved much in a short span of time. He embodies talent and determination all of which is merely a precursor for what is to come in the future. Excellent blog here! Additionally your website so much up fast!